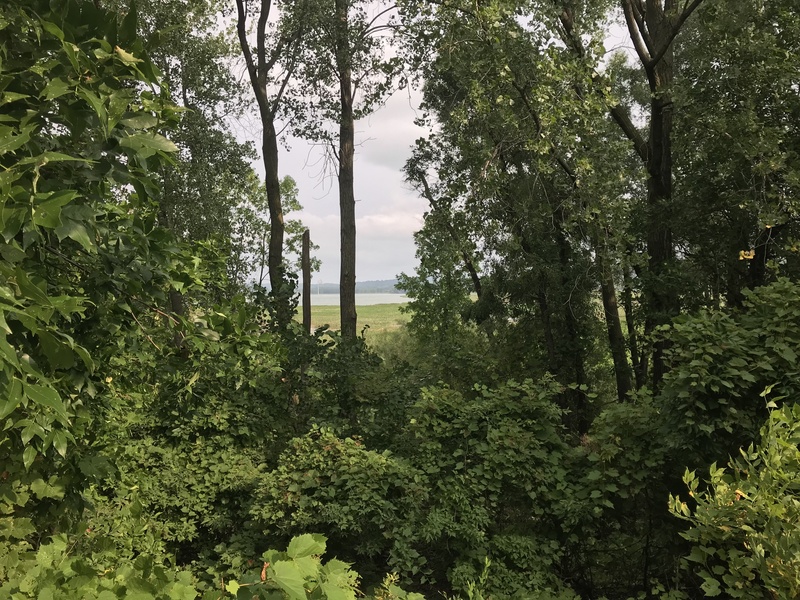 In August, the St. Paul Port Authority (SPPA) proposed to expand railroad access to industrial businesses adjacent to Pig's Eye Lake Regional Park on St. Paul's East Side. This proposal has raised concerns from neighbors and park advocates because railroad access would interfere with the community's plans for accessible parkland and trails, as well as damage critical habitat found there. The SPPA proposes to acquire 7.2 acres of city parkland to lay up to four sets of new rail tracks. If allowed, these tracks would separate Pig's Eye Lake from Eagle Lake to the South. The new tracks would block long-standing plans to build a pedestrian and bike trail that would connect both lakes along their eastern sides. The proposal is working its way through the city's official decision process. FMR submitted a comment letter to the District 1 Community Council at the end of August. In mid-September, the District 1 Community Council decided not to support the SPPA proposal. FMR will continue to follow and advocate for the river during this process. The view on the isthmus between Pig's Eye and Eagle lakes. Currently parkland, a trail is planned here, but the St. Paul Port Authority is working to acquire the property for three or four new railroad tracks. St. Paul Port Authority owns four terminals. This particular proposal concerns Red Rock Terminal, just south of Pig's Eye Lake. You can see the existing terminal in pink on the map below, but with an important addition. The pink triangle to the east of the main terminal and between Pig's Eye Lake and Eagle Lake shows the general area of city parkland that SPPA would like to acquire for new rail spurs. 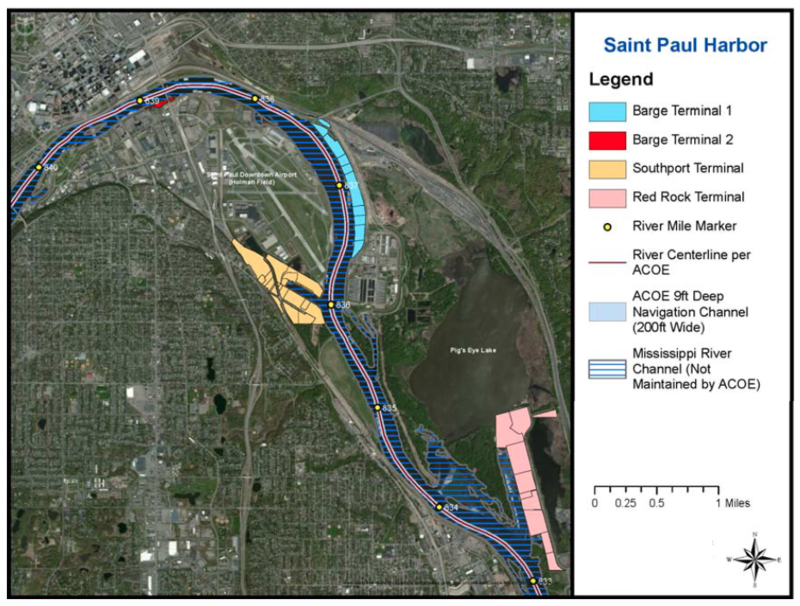 Source: St. Paul Port Authority slide presented at the August District 1 Community Council Land Use Committee meeting. This site is an extremely significant natural area. In addition to being located along one of the world’s great rivers, this parkland is part of our internationally significant bird migration corridor, our Mississippi River national park, a state-designated Critical Area, Pig's Eye regional park and city of St. Paul parkland. The site is also adjacent to Pig’s Eye Island Heron Rookery Scientific and Natural Area. The adjacent neighborhoods and the St. Paul Parks Department have long aspired to make the East Side River District a destination park for nature-based recreation. Their plan would improve access by creating trails that connect to residential areas to the east. 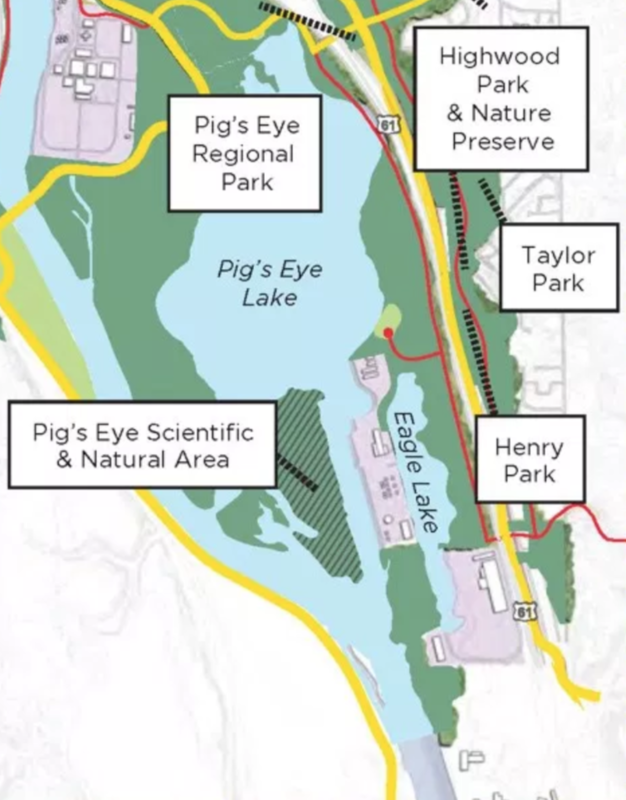 The city's Great River Passage Plan (see relevant portion pictured below) calls for a trail on the east side of Pig's Eye Lake (red line) to connect to Eagle Lake, then to cross the rail lines and Highway 61 to connect with the extensive Fish Creek open space and trail network to the east and south. The yellow rail tracks pictured below show the 7.2 acres of city parkland that the SPPA hopes to acquire through this parkland diversion request. The plan would fill the wetland portion of the acquired acreage in Eagle Lake, then allow Canadian Pacific Railroad to build three or four tracks on the isthmus. SPPA says that this will allow for improved efficiencies and economic growth for Red Rock Terminal. The SPPA also argues that the proposal will solve a safety issue for existing businesses along Red Rock Road. Trains currently block access to all of the businesses, including emergency vehicle access (see the red squares below, indicating frequently blocked access roads). In exchange for city parkland, the SPPA has proposed to provide $100,000 of the $500,000 needed to conduct a schematic design process for Pig's Eye Regional Park. Source: St. Paul Port Authority slide presented at the District 1 Community Council Land Use Committee meeting. FMR believes that while funding for park design is needed, the damage to the existing park vision created by this proposal isn't worth the exchange. Constructing the rail spur would forfeit the possibility of new trails connecting to the broader regional network. This would be a major blow to the community's longstanding desire to create access to this high-value park. Because of the significance of this area, the strength of existing community plans and the current lack of access to the river for the East Side community, FMR agrees with District 1 Community Council: The community deserves answers to some important questions before this proposal proceeds. We also believe a win-win solution may be possible. The SPPA could mitigate access concerns by building a grade-separated trail crossing over or under the proposed tracks between the lakes. And as part of the exchange, the SPPA and railroad could grant rights and funds to the city for a bridge over the railroad tracks adjacent to Highway 61. This would fulfill the park vision and provide East Side residents a connection to the regional park. The proposed park diversion request has been considered by the District 1 Community Council and they do not support it. The district council's recommendation will now go to the St. Paul Parks Commission, which in turn makes its recommendation to the full city council. The process is expected to be completed this fall. FMR is working closely with the district council, Councilmember Jane Prince, city staff and neighbors to find a solution all parties can support. FMR staff works in close collaboration with community members on issues like this. 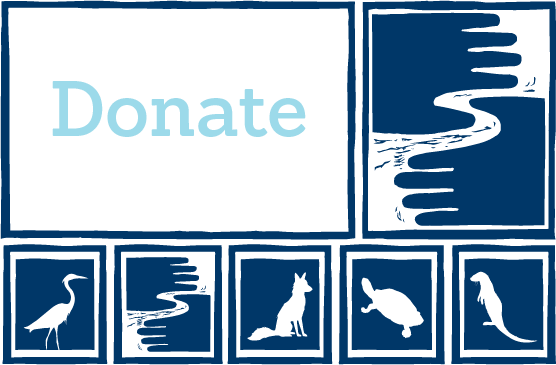 If you'd like to be involved or be notified when river issues arise in your community, sign up to be a River Guardian and be sure to indicate your interest in local issues. If you have any questions, please contact FMR Policy Advocate Alicia Uzarek at auzarek@fmr.org or 651.222.2193 x29.